We've only had snow a few times all winter, so it feels especially beautiful with everything coated in white! 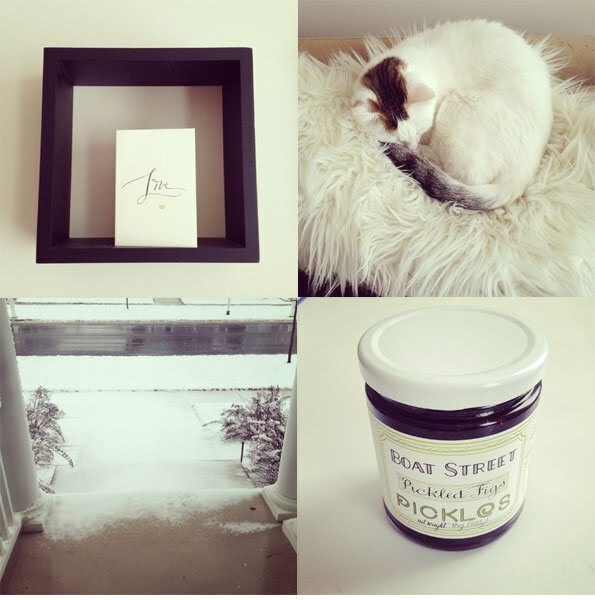 A few snapshots lately in (mostly) white: card, kitty, figs, and view from our front porch this morning. beautiful pictures, mostly adore the kitty. How pretty - stay warm! Aww Minnie looks so cozy. I'm bummed we've barely had any snow all winter in NYC - time's running out! love these :) have a wonderful weekend, alli! Such a lovely and peaceful post! Hope your weekend is marvelous. Love these white weekend photos! Beautiful photos. All is white in Montreal, today's snowstorm is bringing another 20 centimeters.